Football Season. Deer season. Many of our male (and some female!) counterparts have fond phrases to refer to the onset of autumn. Chilly, sunny days give way to sharp, clear nights. And one thing is certain: there’s no doubt this is the favorite time of year for knitters and crocheters alike. Here in Maine, we have another name for this beautiful time of year: Woodstove Season. A time when the logs are split in preparation for the crisp, chilly nights. Sticks are gathered. Fires are kindled. Cider is mulled. And yarn is brought out of its summer hiding places to be celebrated and enjoyed. I had chosen the Embers colorway to represent the warmth that emanates from the fire, but any warm-toned hue would personify that radiance. Woodstove Season is worked from the top down, raglan style. While the Raglan is an extremely common method for creating a sweater, it’s also a method that many knitters of all skill levels can easily master. Therefore, it’s the perfect palette for the complexity that the back’s Deep Chevron motif brings to the table. Superlong arms can be folded back for cozy cuffs, or pulled down over the fingers on days mittens are forgotten. Add in waist shaping, thoughtful bust darts and quickly flared hips, and you have a recipe for a sweater that creates curves on straight-bodied women as well as flatters the full figured body (which I happen to think is grossly underrepresented in the fashion industry). Small, sewn-on chevron pockets adorn the front to add cohesiveness, and 3 closure options (toggle, button, or hidden snaps) provide knitters with the indidivual tweaks they crave to make it personal. Brooklyn Tweed is a new fa vorite yarn of mine, and it comes in an amazing variety of colors! It’s woolen spun as well which is different from many of the typical worsted yarns we see on the market today. This makes for a warmer, yet lighter sweater. So go ahead and give it a try- buy a sweater’s quantity of it–you’re creating jobs!!! I don’t know if I can resist this sweater, simply for the name of it. I would look fabulous wearing this while running our log-splitter, don’t ya think?! If I knew how, I’d send you a pic of the mass quantities of wood my hubby has stockpiled for the winter. 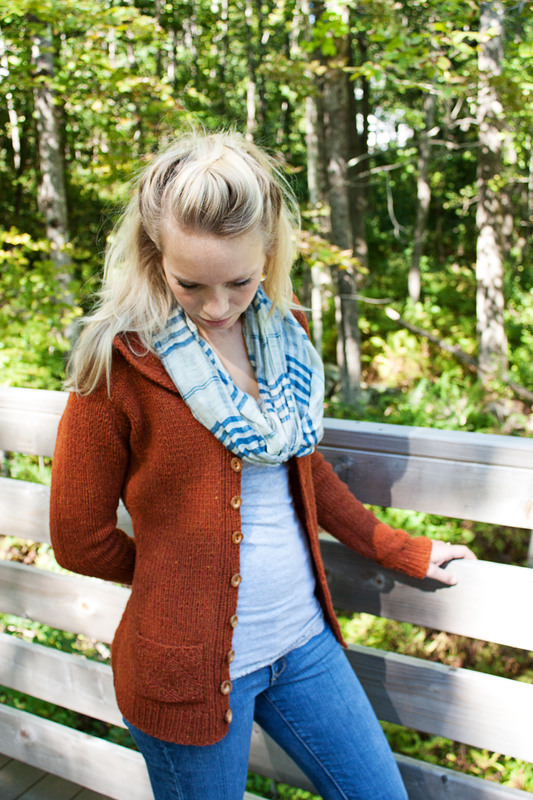 Contemplating my Brown Sheep yarn choices … Nebraska made. I wish I had a fire place to sit by as I cast on for this sweater! Love this pattern! Your sweater is beautiful. I am especially moved by your beautiful witness to Jesus in your profile on ravelry. I want to knit this sweater for your description of the chevrons on the back. Bless you sister!